A reader wrote to me recently and asked if the eGo e-cigarette is essentially like a popular car engine such as the V-12 — something that many manufacturers create their own versions of and build original designs around. I thought that was a really interesting assessment that might help some people understand how there can be so many different e-cigarettes that all have the name “eGo.” All of the strangeness in the e-cigarette industry has to do with Chinese intellectual property laws that do little to punish people who steal ideas. According to the Economist, the damage awarded for intellectual property infringement can be as little as $30,000 per case, which is often less than the cost of bringing the complaint to trial. As a result, companies shamelessly steal from one another — sometimes claiming after the fact that they were the ones stolen from! The eGo-W e-cigarette is one of the latest versions of the eGo design, using a new type of cartomizer that’s easy to fill and stores a massive amount of e-liquid. Is it worth your time? Find out in this eGo-W review. The eGo-W is considered obsolete and is now very difficult to find. 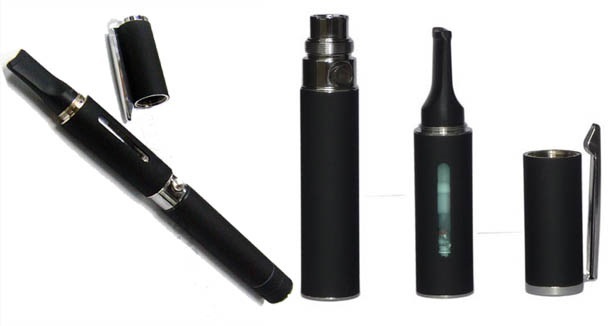 Why not take a look at my article about the best e-cigarette for beginners instead? The eGo-W uses the same battery as virtually every other e-cigarette with the eGo name. It’s a small cigar-shaped battery with a raised 510 connection, capable of supporting most of the atomizers and cartomizers you might throw at it. What sets the eGo-W apart from the rest, though, is a new kind of clear cartridge that some manufacturers have taken to calling the Eliq cartridge. The cartridge strongly resembles a shotgun shell from the outside. When you remove the whistle tip and outer cover from the cartridge, you’ll see a little filling hole on the top. Filling the eGo-W cartridge requires you to jam a needle-tip bottle into the hole and squeeze until the cartridge is nearly full. The required bottle is included with the kit. The cartridge holds 2 ml of e-liquid, about twice that of a standard pre-filled cartomizer. After filling the eGo-W cartomizer, you slide the cover over it and push a black whistle tip over the top. The cover maintains the uniform appearance of the eGo-W, while the whistle tip serves to keep the cartomizer from leaking. In other words, if you prefer a round mouthpiece rather than a whistle-shaped one, you’re probably better off buying another version of the eGo e-cigarette such as Volcano’s Inferno. The whistle attachment is required for the eGo-W cartomizer to work correctly, and if you want to use the eGo-W with another cartomizer or atomizer, there’s really no point in buying it. The Inferno is also superior in terms of vapor production, throat hit, e-liquid storage and overall appearance. The eGo-W also comes with a twist-on pen cap, which further helps to keep it sealed and gives it a nice, smooth appearance. It also clips nicely to your pocket protector, if you’re into that sort of thing. Filling the eGo-W cartomizer is pretty easy compared to some of the other cartomizers I’ve used. The one thing to keep in mind is that there’s a thin silicone barrier under the filling hole, which helps to prevent leaking. The barrier creates a bit of resistance when you fill the eGo-W cartomizer, so you really have to jam the needle in there. Knowing when you need to refill is also easy, since the cartomizer’s outer cover has a little window on the side. With 2 ml of e-liquid storage, the eGo-W should easily keep you going for at least a day if you’ve picked the right nicotine strength. The eGo-W works reliably as long as you avoid rattling it around too much. Although the silicone barrier at the top of the cartomizer helps to prevent e-liquid from leaking out of the eGo-W, it doesn’t do much to prevent it from leaking into the heating coil chamber faster than the coil can vaporize it. At this point, the eGo-W starts to gurgle and vapor production drops considerably. Unfortunately, when I was using the e-cigarette in preparation for my eGo-W review, I found it pretty difficult to carry in a pocket or purse because I’d have to tinker with it to get vapor every time I pulled it out. You probably won’t experience this problem if your eGo-W stays on a desk all day. If you’re a nut for throat hit, the eGo-W isn’t the e-cigarette for you. The eGo-W generates a high volume of cool, mild vapor that works well with strongly flavored e-liquids. When I used it with a Halo e-liquid, though, I really didn’t get much of a nicotine sensation in my throat and lungs — and that’s with an 18 mg e-liquid from a company known for throat hit. If you’ve tried tried another e-cigarette and found the vapor too harsh with any e-liquid, the eGo-W might be worth trying. However, it seems to me that most people want at least a bit of throat hit when they vape, and the eGo-W really doesn’t deliver at all in that department. I also find it difficult to recommend an e-cigarette that’s really only designed to work with one kind of attachment — I like to know that I can use any atomizer or cartomizer I want. Experimentation is fun, and you never know when something might come along that’s better than what you’re currently using. The eGo-W battery will certainly work with other attachments, but you’ll lose the nice appearance that you get from using the Eliq cartomizer with the outer cover and pen cap.